I did not have the system long enough to write in–depth reviews of each of the pieces of gear that I used; nonetheless, the brief experience was sufficient to form first (biased yet firm) impressions, which I would like to share in this article. They are based on the thoughts that I wrote down while using the camera in the field as well as working on the digital files in post–processing. By way of disclosure, I had the system on loan from Hasselblad Shanghai. I have no commercial relationship of any sort with them or any related to them parties. While I do get to borrow photo gear from Hasselblad, I am not given any equipment for free or paid anything vis–à–vis any reviews or articles that I may write. All of my current Hasselblad V system equipment was paid fully by myself, because I felt it was the best choice for me at the time, which predates the relationship with Hasselblad for borrowing equipment. Thus, this report represents my genuine opinions and findings. Impression: an idea, feeling, or opinion about something or someone, esp. formed without conscious thought or on the basis of little evidence. When I started shooting with the Hasselblad H3DII, I was pleasantly surprised that the camera is very user friendly—I figured out how everything works within about ten minutes without reading the manual. If you are not a novice in photography and cannot figure out how a camera works without a manual, it is the fault of the manufacturer, not yours. Generally, the H3DII gives the impression of a solid professional tool that is easy to use—it seems to have everything that a serious photographer might need and, thankfully, is not clogged with useless features (with the sole exception of the tiny inbuilt flash, perhaps). The 50MP digital back boasts the same user interface found on the CFV–39 digital back; it is built around Instant Approval Architecture (IAA), which I find very innovative and intuitive. Detailed report on the IAA can be found in my review of the CFV–39. The H3DII system is made of what seems the best possible combination of high quality plastics and metal. All crucial parts where durability and precision are paramount (e.g., lens mount, battery lock, etc.) are made of metal; at the same time, plastics are extensively used where it is permissible and does not compromise performance of the camera. Many of us love old fashioned, all metal cameras; I, however, feel that the use of plastics was perfectly justified—the system is far from light as it is and I think Hasselblad have achieved a very good balance between delivering adequate build quality and reducing the weight. The camera has an integrated grip that incorporates the battery. On the one hand, I realise that this probably is the most sensible solution to include a power source without adding an unnaturally protruding part. On the other hand, the grip significantly adds to the bulk and, at least on a psychological level, weight of the camera. When you mount one of the (massive) H series zooms, the combo becomes almost unwieldy—try nursing it for a couple of days and you will know what I mean. To also put it into perspective, my Kirk BH–1 tripod ball head seemed barely adequate for the use with the system. Most controls seem to be logically placed (if you enjoy modal camera operation, that is, which I am not a big fan of), although I really wish the buttons were larger. They are small to the extent that you have to pay attention to pressing them as if you are handling something fragile; using the camera when wearing gloves is rather unrealistic. The mirror–up button is located at the front of the bridge that connects the camera and the grip and thus it is right there under your fingertips. At first glance this is great and how it should be on all cameras; however, when the HTS 1.5 tilt–and–shift adaptor is mounted on the camera I cannot squeeze my fingers in to reach the button (and no, I do not suffer from the sausage fingers syndrome). Exposure metering is in the form of the basic Centre Weighted, Centre–Spot and Spot pattern. If you are used to sophisticated matrix metering that takes care of exposure in 95% of instances, be prepared to use the AE–L function or exposure compensation quite a bit to optimise digital capture. 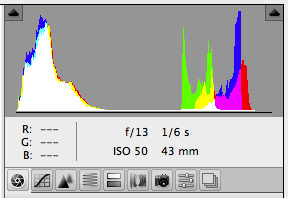 The 50MP back, unfortunately, shows luminance histogram only. I have already complained about the lack of RGB histogram in my review of the CFV–39 and have to reiterate it again here. 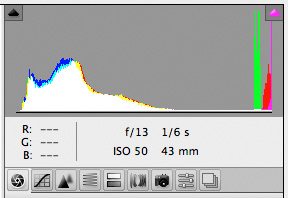 A simple luminance histogram simply does not suffice to make a knowledgeable judgment on exposure. This is further complicated by the contradictions I often saw between what the histogram and highlight warning indicated: many times the histogram would show quite a lot of room on the right yet, at the same time, highlight warning would already be blinking in fairly large areas. In such instances it is not obvious what exactly is going on; furthermore, this issue is exacerbated by the highlight image quality problem I describe below. I did quick–and–dirty tests of the lenses and, to cut to the chase, they appear first rate. The HCD 4/28 lens has a very large image circle (it can be shifted 18mm) and thus exhibits minimal light fall–off; it is already plentifully sharp centre–to–corner at f/4; although the lens shows complex distortion, its degree is minimal. The HC 3.5–4.5/50–110 zoom, on the other hand, does not perform as admirably wide–open but seems to be a fine lens once stopped down. Its real drawback is that it is huge—when I mounted it on the camera for the first time I instantly thought that were I to own the system I would certainly use prime lenses only. In short, I expect all H series lenses to be very fine. This being said, my impression has been that the best Hasselblad V series lenses are still a notch better. I cannot quantify or support this claim with evidence, so take it with a pinch of salt. As is probably expected from most current medium format digital backs, image quality is nothing short of astonishing. First off, 50MP is a helluva lot of resolution, quite likely more than most of us can realistically use. Consider this: using my 17" printer, I cannot print original files without downsizing them even at 360dpi—unbelievable! To put it differently, you can produce a 17" by 23" print that is tack sharp no matter how closely you look (provided you know what you are doing, of course). Were I to buy a medium format digital back with my own hard–earned moola, I would most likely go for a more sensible 39MP option. Second, there is the quality of the pixels. The 50MP back does not have an anti–aliasing filter and per–pixel sharpness and acuity are absolutely superb. Moiré can be a problem in some situations, but it can be dealt with in post–processing in Hasselblad Phocus software (this being said, see my comments on the file format issue below). There, however, was a problem with image quality that I noticed while still shooting in the field. The H3DII is a very complex camera system and I cannot attribute the problem to any particular link in the chain; therefore, I will simply describe what I encountered. Basically, the issue is as follows: when overexposure occurs, or if there is even an inkling of possible overexposure, a strange colour separation takes place in highlights—they mostly acquire a magenta cast that cannot be removed in post–processing. Normally, slight overexposure can be easily recovered in RAW converting software; in case of the 50MP back, however, the magenta shift gets worse as you try to recover highlights with the use of either "exposure" or "recovery" slider. I tried dealing with the issue in both Adobe Camera Raw (ACR) and Phocus software, but to no avail. Quite strangely, in most cases highlight detail is there and can be recovered without problems; however, the more you recover it, the stronger the magenta cast gets. I have numerous files with the problem and below is a typical example (I have no idea what the vertical line/division in the sky in the middle of the second shot is). 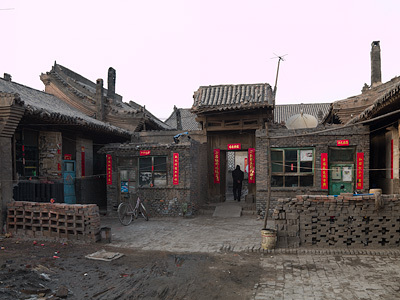 If you look closely, the issue can also be seen in this photograph in my Pingyao gallery. Now, I do not know whether this problem pertains to this particular camera and/or digital back only, or if it is a more general issue (which I doubt, as I have not seen any other reports on this on the Internet). I have sent sample images to Hasselblad and will post an update if/when I hear from them. Before then, I strongly advise against jumping to conclusions. Thinking back of my experience with the CFV–39, it seems that the pixels on the 50MP back have gotten a little too thin and one has to be more careful with them. My impression, which might be nothing but misinterpretation of the problem outlined above, is that dynamic range of the 50MP back is not as great as that of the CFV–39 and files produced by it are not as robust as those coming from its baby brother. Nonetheless, shadow detail and cleanliness are great and allow for a lot of manoeuvring in post–processing; thus, in my experience image quality is superb as long as you avoid overexposure. Unlike the CFV–39 digital back the H3DII, thankfully, shows battery life and does so in a fairly accurate fashion. Battery life, however, whereas not too bad, is far from state–of–the–art. During my trip to Pingyao I observed a very consistent performance: one fully charged battery lasted for approximately four hours of shooting or just under 100 exposures (whichever came first). On the second day in Pingyao I used up the three batteries that I had and the last shots of the day were taken while nervously disregarding the "Replace battery" warning. I was almost ready to pull out my Hasselblad Flexbody that I brought just in case and switch to shooting film but, fortunately, it did not come to that. In summary, I would not feel comfortable going into a full day of shooting with less than five fully charged batteries. This will probably sound somewhat exaggerated but I immediately fell in love with the HTS 1.5 tilt–and–shift adapter. If you look at my Pingyao gallery, you will notice that the vast majority of the images was taken with it. Indeed, there is a lot to like about the HTS 1.5. First, it is very easy to use when compared with, say, the Hasselblad Flexbody, which currently is the only camera in my arsenal that gives me the tilt–and–shift capability. Seriously, I never imagined that tilt–and–shift could be so painless. Second, tilt and/or shift information is recorded in the EXIF data and can be retrieved in Phocus software. 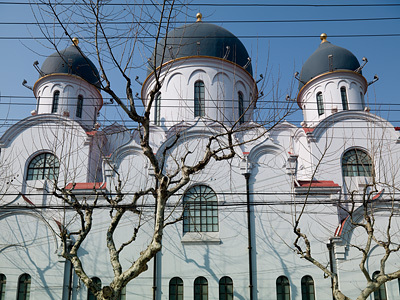 Third, technical imperfections of the optical system can be automatically corrected in Phocus software, too. Finally, the adaptor can be used with no less than five fixed–focal–length H series lenses, which is astounding in my book. As you might have already gathered, the adaptor would be on the top of my shopping list were I to own the system. The use of the HTS 1.5, however, is not completely issue–free: when the HCD 4/28 lens is shifted (I cannot speak about other lenses as I have not used them), part of the image acquires a greenish tint. It is not massive and most people will not immediately notice it; however, if you have a discerning eye and/or look at a number of images where the shift function was used, it is undeniably there. Below is an example of this issue (sorry that the image completely lacks any aesthetic merit)—the lens was shifted upwards to the maximum and the bottom of the images has a visible green colour cast. The green colour shift most likely is caused by the physics of how the light hits the sensor when the lens is shifted to a large degree and it is not a defect per se. Thankfully, the issue can be easily corrected with the use of Phocus software (again, however, see my notes on the file format conundrum below). Four or five times I received the warning "Restart Back". I did not do anything unusual and do not know what caused this issue. Switching the camera off, removing the battery, attaching it again and switching the camera on solved the problem. Once there was also a bizarrely exposed image right after the camera was turned on (I, unfortunately, did not write down the error number), which was followed by a request to restart the camera. Given that this is the third iteration of the H series camera, I am quite surprised that it still has such glitches. 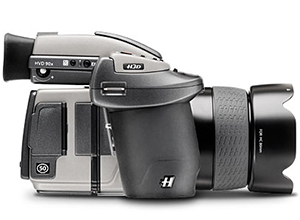 I hope that the recently announced Hasselblad H4D will be a better sorted camera in this respect. A 8GB CF card accommodates approximately 100 images, i.e. an image created by the back is on the average 80MB in size (in my experience file size actually ranges from 70MB to 90MB depending on the subject). In only several days of shooting I took over 45GB worth of images, which is after deleting obviously unsuccessful photographs. The issue of storage takes on a completely new dimension when you get to such enormous resolution. The back produces .3FR files and they can be opened and worked on in ACR. The problem with using ACR, however, is that it does not have some of the H system specific benefits that Phocus software offers (e.g., automatic, lens–specific correction of distortion and chromatic aberration). If you want to use Phocus software, however, .3FR files must be converted to .FFF format during import, and I was actually suggested deleting .3FR files after converting them to .FFF format. While the .FFF format offers the benefit of using all native advantages of Phocus software, it is not recognised by ACR, which I am not very comfortable with. The question then is: do you use .3FR files and lose the advantages of using Phocus software, do you use .FFF files and lock yourself into a format that is not recognised by a major image processing software, or do you keep and use both for different purposes? As I used the camera for a short period of time only, I went with the last option. However, I do not think it is a satisfactory long–term solution as it is likely to cause workflow and storage problems. To be fair to Hasselblad, though, most camera makers that use proprietary RAW formats have similar problems. For example, it is generally acknowledged that the best quality conversion of Nikon NEF files can be achieved with Nikon Capture NX software; however, many photographers prefer using ACR or Adobe Lightroom for speed, efficiency and reliability. Therefore, this issue should be considered in the grand scheme of things and with the view of the current trends. The H3DII is a fully competent camera system that is most certainly capable of delivering outstanding results in the hands of the right photographers. It has a few idiosyncrasies that might take some time to resolve, figure out or get used to (which camera system does not? ); this, nonetheless, is not something that gets in the way of producing stunning image quality if you know the system well. On a personal level, however, I have to say that I did not fall in love with the H3DII at first sight (then again, top–end commercial photography, which is the primary market the camera is aimed at, is seldom about love). Were I to switch to a medium format digital system, I feel that the CFV–39 combined with the V system would serve my needs better, even though the H3DII offers a number of tangible advantages over it. Although this probably mostly reflects my personal biases (minimalist approach and years of intimate relationship with the V system), I reckon many existing V series system users would have a similar take on the matter. Shortly after posting the review I received a reply from Hasselblad that addressed some of the issues mentioned above. The speed and thoroughness of the reply once again highlights the first–rate customer service of Hasselblad, which is consistent with my previous experience of communicating with the venerable camera maker. Highlight magenta cast was the most serious issue that I encountered. As I suspected, it was simply a defect of the particular camera that I used. In the words of Hasselblad technical support staff, "It is not a general issue with Hasselblad digital capture units, it is related to the calibration files / gain adjustment on this particular unit, and it has to come back to the factory for a re–calibration of the sensor." With this problem now addressed, I would like to reiterate that image quality that the system delivers is absolutely stunning, bar none. I have to also note that this issue once again reminds of the rule that every photographer must adhere to: never use untested equipment in the field for real–life applications. Regarding the inaccessibility of the mirror–up button when the HTS 1.5 adaptor is mounted on the camera, I failed to realise (or read in the documentation) that I could reprogram three other buttons to perform the same function. Owners of the system can customise the camera to suit their shooting styles and ensure fluid camera operation.